This narration explores spaces of fandom for Harry Potter across London. Across different locations, Harry Potter fans seek to make connections with their fandom through people, artifacts, and cult geographies (Hills, 2002) that exist as spaces of memory. 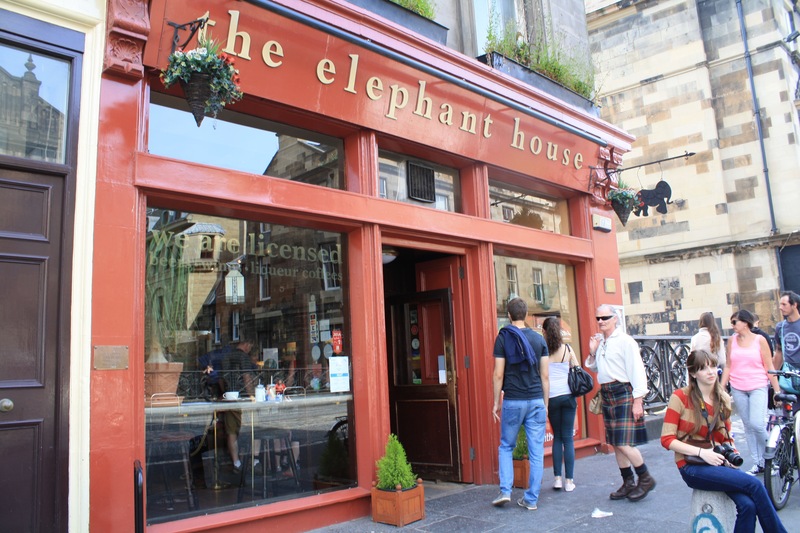 Every day, Harry Potter fans visit The Elephant House, a small coffee shop in Edinburgh, Scotland, that advertises itself as the “Birthplace of Harry Potter.” Visitors will quickly notice that although they sell “Birthplace of Harry Potter” merchandise, The Elephant House isn’t a typical Harry Potter tourism spot; The Elephant House is a business. Much like the Ianto memorial, it is a privately open space that the public can access for memory-making activities. This coffee shop took on an elephant motif, with the interior covered in elephant-themed furniture, wallpaper, books, and more. A fan could order a cup of coffee, purchase a souvenir, or glance at the walls and read through article clippings where J.K. Rowling described how The Elephant House influenced her writing. The owners seemed proud of their connection to the books. 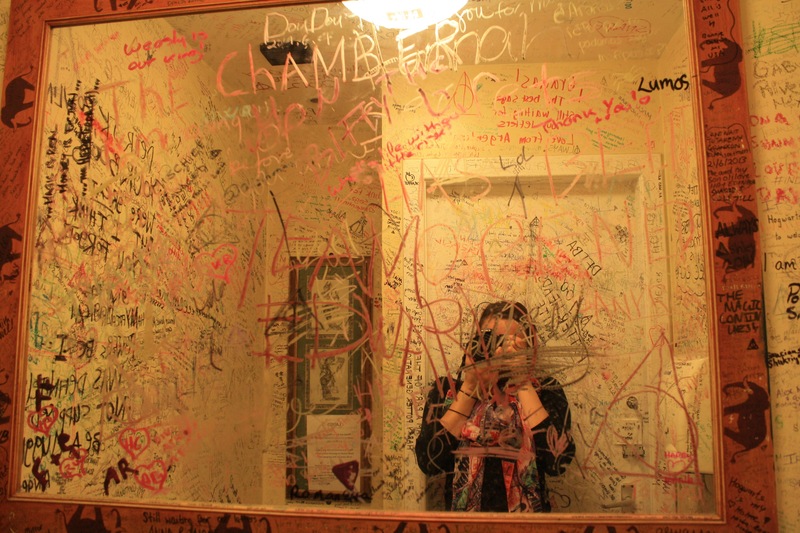 The real surprise was located in the bathrooms of The Elephant House, where fan writings completely covered the walls from floor to ceiling. On the toilet, floor, ceiling, mirrors—there was so much written, layered and layered, that much of what was here was somewhat illegible. 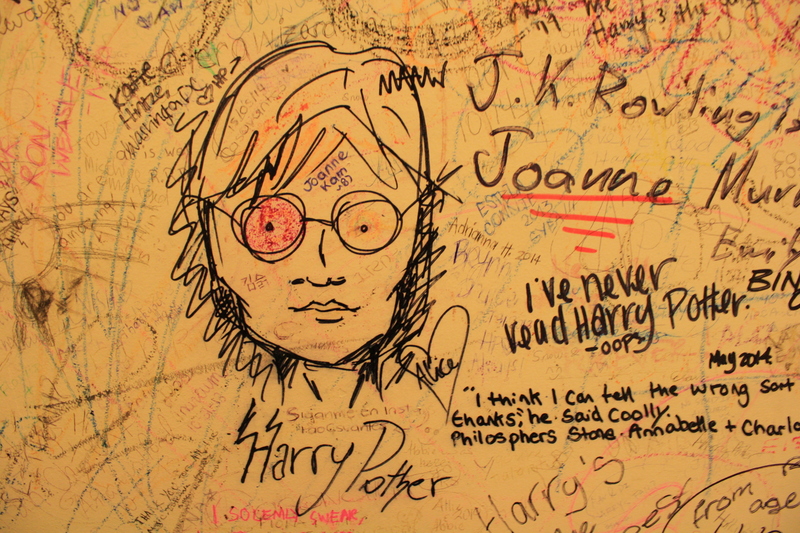 Of what could be seen, there were doodles of characters and symbols, signatures with dates, Harry Potter quotes and references, letters to J.K., and even newer inside jokes from fans. 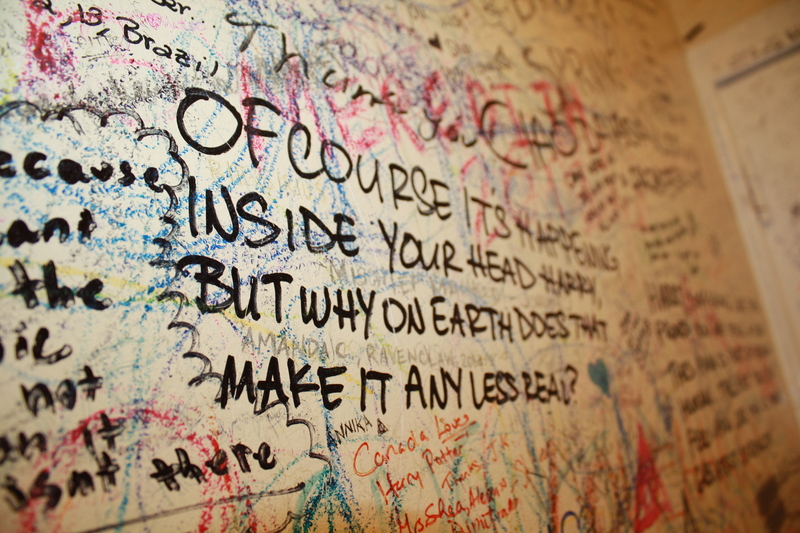 It was for this reason that fans online tell each other to bring markers when visiting The Elephant House. Some fans make a pilgrimage to beloved Harry Potter spaces such as the Warner Brothers Studio Tour: The Making of Harry Potter, the Millennium Bridge, and Platform 9¾ among others. While it's important for fans to track notable places related to the books or the movies, The Elephant House seemed different to us. 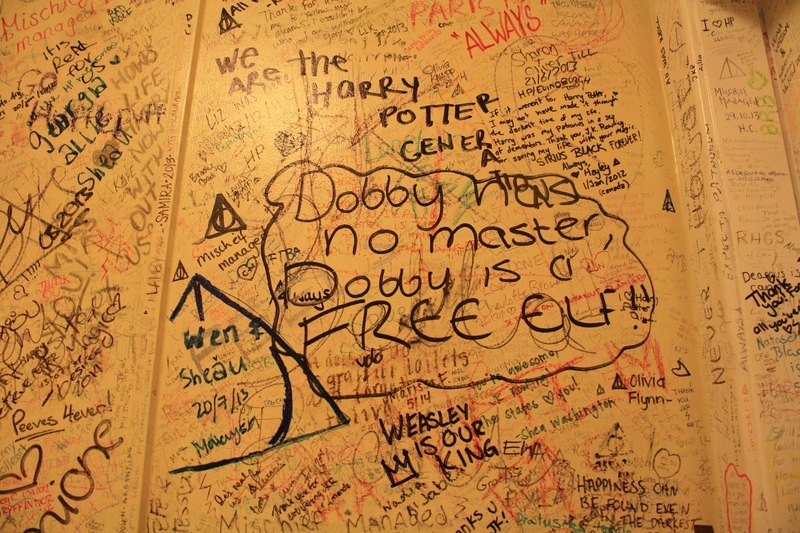 Walking into that bathroom, we realized how important it was for people to make that trip just to mark that space, to commemorate their connection with Rowling herself, and to connect with other fans. Making the journey out to this space was different. You had to hear about it from word of mouth. There were no tickets to buy or advertisements for it, just exploring and relying on what digital research was done in anticipation of our trip. It felt like a well-kept secret—like you had insider knowledge about where J.K. Rowling spent her days writing Harry Potter. In that sense, the space felt more authentic. As fans, this was the reason for visiting—the authenticity, and the direct connection to Rowling herself and the birthplace of the series. During this trip and a second trip in 2016, we visited the newly built Platform 9¾ in King's Cross—a space outside of the actual train platform. 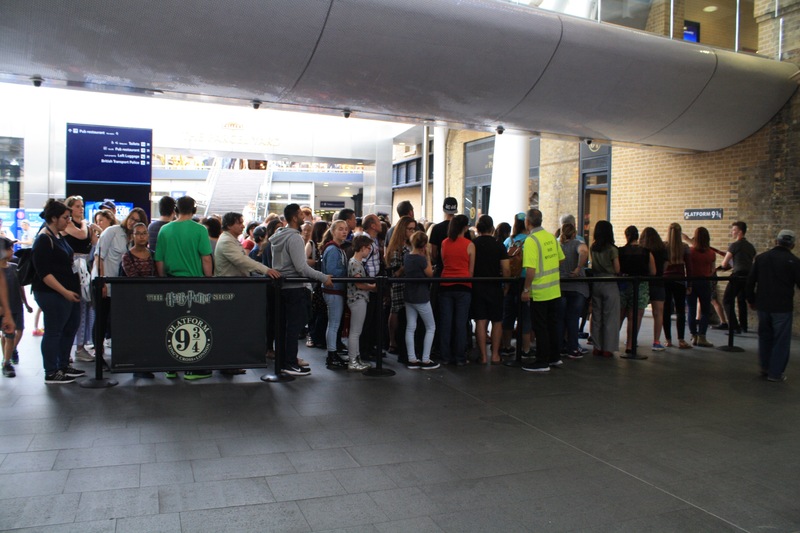 It allowed fans to line up, usually for an hour, to get their picture taken as if they were running through the real Platform 9¾. Each time we visited the space, we expressed disappointment in the lack of “real meaning” to the space. For example, the signage, placement, and experience do not match up to the real set, even though it was fully authentic in the eyes of the Harry Potter franchise. This mismatch resulted in disappointment for us. While this train station itself is a cult geography (Hills, 2002) for fans of the books and films, the staged experience here, roped-off line and all, made it difficult to feel the authenticity of the space as a fan. The Warner Brothers Studio Tour, much like the Platform 9¾ space, allowed fans to view the conceptual artifacts of the Harry Potter movies. Here, fans could spend as much time as they wanted to roam the space and view picture-perfect sets, interactive artifacts, conceptual sketches and artwork, and even the model used for Hogwarts. In Platform 9¾, fans were not allowed to “soak in the experience” but shuffled through the queue as quickly as possible. Even though the Warner Brothers Studio Tour allowed you to linger in most parts, the experience was static. In both spaces, you were often surrounded by giant crowds and given a set of rules to abide by. Although these “official” spaces were Rowling- and Warner Brothers-approved, the time spent in the spaces didn’t allow the fans to fully reflect on and experience the space in their own way. And although the experience at The Elephant House was smaller, the act of making a mark, being able to picture J.K. Rowling writing just a few feet away, and going to the “place that started it all” made the experience more worthwhile. Here, we tangled with the notion of “real” and “imagined” spaces. Grappling with the notion of a “real” space for the writer, we observed the writings in this space as yet another paratext—one where fans could participate at this tea house and become part of a larger narrative about the books. In this space, we could see Edward Casey’s (2004) assertion that memory is attached to a past and the need to act to ensure there will be a future to remembering (p. 17). We will explore this more in the next section. We learned that the importance of a space’s authenticity goes hand in hand with a fan’s ability to make a mark in that space. While fans long for authentic spaces, they ultimately want to feel a sense of agency—of ownership—within the space, and be allowed to craft their own experience.